With all due respect to FOX’s The Gifted, The Blot’s favorite X-Men television show – FX’s LEGION - returns next week, and The Blot is pumped! Filled with unforgettable visuals and fantastic storytelling, Noah Hawley’s wild vision and take on Marvel’s David Haller and the iconic wider X-Men universe was unlike anything the genre has ever seen. 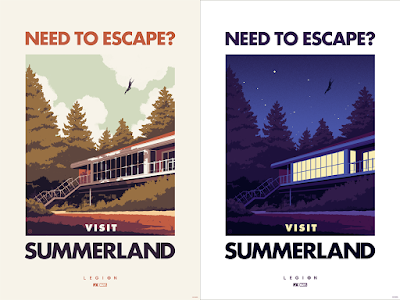 To celebrate the first season’s release on Blu-ray and DVD today, Mondo has teamed up with FX and Phantom City Creative to create a great travel poster inviting you to visit Summerland, the headquarters and mutant training facility for David and his allies. LEGION: Visit Summerland by Phantom City Creative is a 24”x36” hand numbered screen print. This fantastic Summerland screen print will be available in two versions, Day and Night. Both editions are limited to just 200 pieces and will retail for just $50 each. But act quickly because only 75 of the Day Edition will be made available via Mondo. Fans of this inventive television series can purchase these Marvel X-Men posters at a random time today, Tuesday, March 27th, at the Mondo online store.